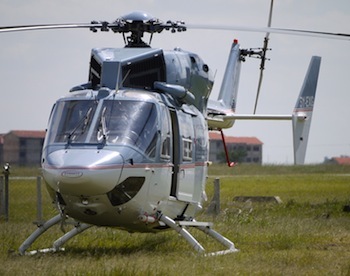 The Airbus BK117C1 is a twin engine helicopter whose rugged but sleek design and large cabin interior provides mission versatility without sacrificing comfort. It is one of the world's leading Medevac and Search & Rescue helicopters. Besides its low vibration level in flight, the Airbus BK117C1 provides easy loading and unloading of stretcher patients using 2 large rear clamshell doors. Everett Aviation operates several Airbus BK117 helicopters, some of the aircraft are IFR certified with 3 axis coupled autopilot and other advanced capabilities such as full NVG cockpit, cargo hook, FLIR and "SX16" night sun. For added safety the helicopter has a flight data recorder and GPS based tracking system.